Samuel Dunn was a British mathematician, teacher and amateur astronomer. 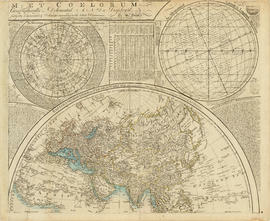 Item is a combination terrestrial and astronomical map, with the earth depicted as the eastern and western hemispheres, with corresponding astronomical hemispheres. 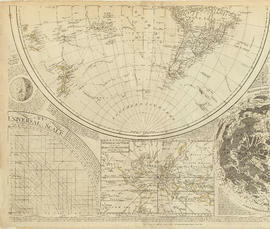 The map depicts broders of states, geographical features, cities, routes of prominent voyages. 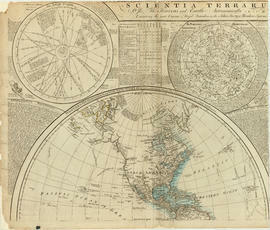 The map is bordered with smaller inset maps of the solar system, the north pole, the south pole, analemma, the moon, and a world map in Mercator's projection. Map appears to have been cut out of an atlas or other book. 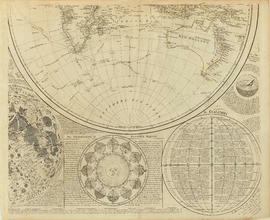 The four plates that make up the map appear to have been taken from a book. Plates have been repaired and backed with Japanese paper.